About two weeks ago, I blogged about sunless tanners and how I was looking for one that not only gave me a nice glow, but also didn't posses that fake tanning smell (see post here). I decided to try ST. Tropez Gradual Tan and found I am very happy with the results. Although I don't look like I just got back from St Bart's, I do have a nice glow instead of a pasty complexion. The best part is the smell, or should I say lack of. Instead of a fake tanning smell, it has a nice sent which I can only smell while applying the lotion. Although it feels a little heavier than my normal body lotion, within 10 minutes it is completely dry and my skin feels smooth. 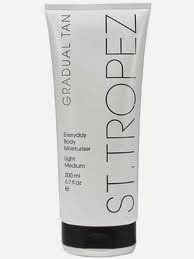 I would recommend St Tropez Gradual Tan for someone who isn't looking for a quick fix, as it is gradual, and will definitely be using it all winter. Please share if there is a self tanner you love and think I should try.